Hailing from small-town Bridgeton, NJ, I always felt a calling on my spirit to inspire youth and help others. I describe Bridgeton as a “small town with big city problems.” Growing up in a city with a median family income of $30,000, and where poverty, teenage pregnancy, and violence serve as cripples to progress to this day, I became aware early on that in America where a child is born has great influence on his/her life outcomes. These life experiences led me to commit my life to helping people growing up in poor and under-resourced communities. I aim to level the playing field and empower youth to find and attain their wildest dreams by using education, coupled with building sustainable living communities, as the great equalizer. This sense of humanity was instilled in me by my parents at an early age. As a youngster, I would travel with my mother, Evangelist Darlene Bunting, to local nursing homes during the holidays to deliver Christmas messages. I would also perform liturgical dance at churches around South Jersey where my mother ministered. My father, John Bunting, a middle school guidance counselor, helped me understand the importance of education early on. He pushed me to travel and see the world beyond what my small-town had to offer, and signed me up for a variety of extracurricular experiences that broadened by worldview. It was that childhood foundation that led me to want to first help those in Bridgeton. In school, I would inspire my classmates to go to college, and get involved in their local community. I would round-up my peers to participate in summer college programs, and once advocated for my local zoo to become smoke-free. At an early age, I knew I wanted to help people. I just had to figure out how. After graduating from Bridgeton High School, I attended the University of Maryland-College Park. Once at the university, I hit the ground running and became an actively involved student. Through two years as a CIVICUS associate and later as a Beyond the Classroom participant, I learned more about being an engaged citizen, and concrete ways to take part in changing the world around me. I juggled being a Resident Assistant, working at the Office of Undergraduate Admissions, and being Black Student Union president. 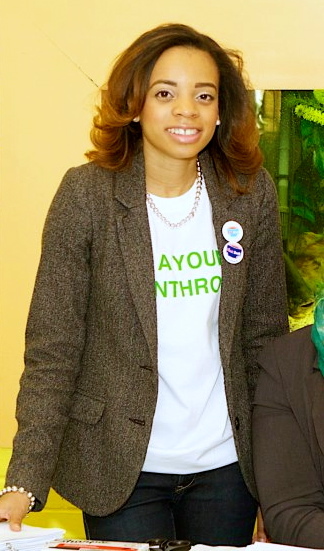 I volunteered with various organizations and spent my summers working in the field of education. It was at the university that I was introduced to Teach For America. During my senior year, I applied and was accepted to teach elementary education in New Orleans. I taught third, fourth, and fifth grade literacy and social studies at Milestone SABIS Academy of New Orleans. It was at Milestone that I helped to plan the school’s first College Week and was the facilitator of the Girls to Ladies Student Life Club. While in New Orleans I also served as a board member for First Book. In 2010, I relocated to Washington, DC and it’s now where I call home. I taught third grade literacy at DC Scholars Stanton Elementary. DC Scholars Stanton, formerly Stanton Elementary, is a District of Columbia Public Schools partner school in its third year of turnaround. At the end of the 2012 school year, I decided to take the next step in my education journey. I made the difficult decision to leave the classroom. I went on to pursue a Mastered in Education with a focus on education policy and leadership from American University and also worked with College Summit as the organization’s Volunteer and Alumni Engagement Manager helping to get students from low-income and under-resourced communities to and through college. Currently, I am the DC Regional Manager for Enriched Schools. Enriched Schools – an education startup company & community talent hub. We connect schools with awesome flexible staff, like substitute teachers, enrichment instructors, coaches and more in order to eliminate loss of student learning due to teacher absence. When I’m not working, I am actively volunteering in the community. I established and chairs Team First Book-DC, the local affiliate of First Book, and has led the volunteer board to raise over $130,000 and distribute over a half million books to children in need in the District of Columbia. Additionally, I volunteer with BUILD in order to teach high school students about entrepreneurship, and am a member of the Junior League of Washington, Leadership for Educational Equity and former board member of Capital Cause. I’ve had the honor or receiving The EnVest Foundation’s 40under40 Award, Millennial Week’s Award for Social Good and numerous other accolades for my public service contributions. Feel free to follow me on Twitter @darlabunting for daily updates on education reform and philanthropy and everything in between.